Reveal a Whiter Smile Today! How often do you find yourself hiding your mouth when speaking, smiling, or taking pictures? At BGH Dental, we believe even one time is too many. You do not need to hide behind a discolored smile. We can help you turn back the hands of time with teeth whitening in Greenfield. 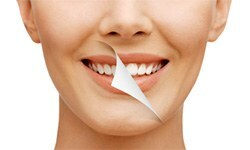 We offer two solutions to get your teeth several shades whiter with results that last. Tooth discoloration is a natural part of the aging process. As your enamel becomes thinner, more of your dentin will show through, which has a yellowish hue. Although it is unavoidable, there are also several stain-causing factors that can cause your smile to darken sooner. Poor oral hygiene habits, smoking, and consuming darkly pigmented foods and drinks make your teeth to discolor quicker. To restore a bright smile, you have probably tried several over-the-counter products. While they may be convenient, they will not give you the results you want. They do not contain professional-grade whitening agents, so they will not deeply penetrate your enamel. Do not worry. You are not out of options. We have the solutions you need to get the results you want. We use professional-grade whitening gels to reverse tough stains to restore your enamel to its previous state. After performing an initial consultation, your cosmetic dentist in Greenfield creates a customized treatment plan to reveal a brighter smile. In just one day, your teeth will become several shades whiter. We apply a special protective barrier to your gums and lips to avoid any irritation. 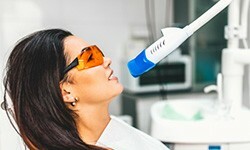 After the whitening solution is on your teeth, a special light is used to activate it. For an average of three 15-minute intervals, the gel breaks up the discoloration molecules to provide a drastic improvement to the color of your teeth. Now, you can get in-office results from the comfort of your own home. 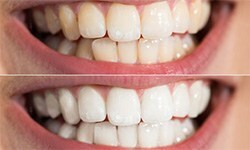 We provide you with the high-quality whitening gel and custom-fit trays to whiten your smile around your own schedule. You wear the trays following the recommendations of your dentist for about 2 weeks. After only a few days, you will begin to see a whiter smile shining through. Your new smile can stay bright for several years with the right aftercare. To protect your results, it is best to maintain your oral hygiene habits at home and visit your dentist twice a year for a cleaning and checkup. If you eat or drink stain-causing foods and drinks, like coffee or berries, be sure to brush your teeth right away. If you cannot, rinse your mouth with water. You also want to avoid tobacco in any form to prevent new stains from developing. You do not need to feel insecure about your smile. BGH Dental has the solutions you need to restore your confidence. Contact our office today to schedule your consultation for teeth whitening. We look forward to improving your smile.